I like the book, it is easy to read yet it makes you think and feel. My purpose with buying the book was to learn more about Zen, to be able to put the pieces together in my own view of Zen and mindfulness. 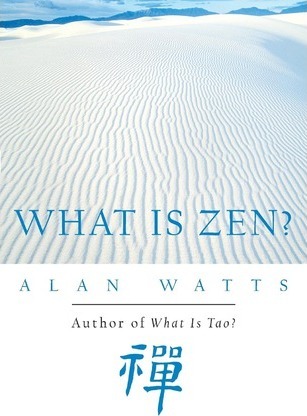 In the first part Alan writes that “Zen is a method of rediscovering the experience of being alive”. He brings up the concept of “ten thousand formations, one suchness”, there is simply one energy. If you understand fully that it is from the present that everything happens, then the only place for you to be, the only place for you to live, is here, right now. If your plans are flexible and adaptable, and if you are here when things happen, you will always stay balanced. Alan also writes “Anything that you can do without a great deal of thought becomes a perfect form of meditation”. That is the same as is said in The 5-minute Meditator. The third part about the book is about space, how empty space is considered more important in the East than in the West. Alan mentions that Zen represents a simplified way of life and that the personality of Zen people is the uncluttered mind. He also says that “The beginning of Zen is overcoming the fear of death”. That is what made the samurai interested in Zen, as a way to become fearless. The whole point of Zen is to suspend the rules we have superimposed on things and to see the world as it is – as all of a piece. Posted on August 6, 2008 by BengtPosted in Bits and piecesTagged Books, Review, Zen-related.